Kiki & Lala Everywhere! Collaboration Cafe Opens in Shibuya Parco! Little Twin Stars, twins Kiki (male) & Lala (female), are characters that have been loved ever since their creation in 1975. Next year is their 40th anniversary, and coming before this a collaboration cafe has opened in The Guest Cafe & Diner on the seventh floor of Shibuya Parco Part 1. Kiki & Lala were developed as characters to adorn various goods by Sanrio, the same company responsible for a slew of other popular characters including Hello Kitty and My Melody. Many reading this have no doubt used, or at least seen, stationery before with Kiki & Lala on it. The cafe is arranged in an open style and the exterior and interior are decorated everywhere with Kiki & Lala. Large figures of Kiki & Lala are set up at the entrance, and patrons can take commemorative photos with them. Large figures of Kiki & Lala greet guests at the entrance. They can even stop to take commemorative pictures with them. The first thing I was happy about after being shown to my seat was the Kiki & Lala limited paper luncheon mat. I was greeted by a lovely illustration of the two. I was also happy to find that the mat can be taken home as well. On to the food. The cafe has prepared an original Kiki & Lala collaboration menu. My recommendation is the appetite-stimulating “Fluffy Omelette Rice with White Curry Sauce.” As the name describes, the eggs are fluffy and delicious. My recommendation for sweets is the “Kiki & Lala Extravagant Crepe with Lots of Fruit.” With this treat, you can enjoy lots of tasty fruit. These two menu items also come with a Kiki & Lala Cafe limited mug (limited to 3,000. Available on a first come, first served basis.) that is also available to take with you. The “Kiki & Lala Extravagant Crepe with Lots of Fruit” (1,480 yen) is filled with fruit and is quite satisfying. The “Fluffy Omelette Rice with White Curry Sauce” (1,580 yen) has simmery and fluffy eggs. I have one more food recommendation for those who will come with a friend and each will order different plates and share them: the “Little Twin Stars Hamburger Plate.” The beef patty and salmon patty are perfect for sharing. A highlight of the drink menu is the original lattes. You can choose from the “Kiki Latte” or “Lala Latte,” but the latte art on top might make you hesitate in drinking it. For those who can’t decide, I recommend the “Honey Milk Chai Tea” that comes with a topping of both Kiki & Lala. These drinks are great not just for their cuteness, but for their gentle flavor that will wash your stress away. The “Kiki Latte” and “Lala Latte” (650 yen). Which would you choose? The Kiki & Lala Cafe limited coaster that comes with each original drink order is also cute. There are five to collect, and the illustrations match the tapestries hung around the cafe, meaning that they were drawn specifically for this collaboration cafe. These can also be taken home, but don’t put a mug on top of them! On your way out, don’t forget to bring your memories of the cafe home with you by buying a “Kiki & Lala Strawberry Roll Cake.” The Kiki & Lala Cafe will be open until the end of May. The cafe is so popular that on a weekday morning, more than 50 people were in line, but it’s certainly a special time with which to enjoy the world of Kiki & Lala. Definitely bring a friend along and enjoy sharing this cute world with them. This is a Tokyo Otaku Mode original article written by Nobuyuki Hayashi and translated by Jarrett Meuser. The Kiki & Lala Cafe tote bag (pink or blue) (1,600 yen) is also useful as a makeup pouch. The two-piece Kiki & Lala Cafe clear file set (600 yen) and the Kiki & Lala Cafe notepad (600 yen). It’s always good to have stationery on hand, don’t you think? You’ll want one each of the pin badge (300 yen), key chain (400 yen) and name stickers (300 yen) as commemorative collectables. The Kiki & Lala Cafe iPhone case (1,800 yen) is another great item to carry around every day. When seated, I was greeted by the Kiki & Lala Cafe limited luncheon mat. This can also be taken home. The “Kiki & Lala Strawberry Roll Cake (1,905 yen) is a limited takeout item. Eat it together with your friends. 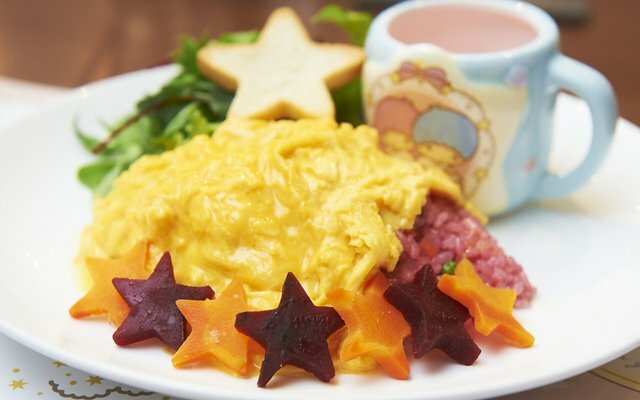 The “Little Twin Stars Hamburger Plate” (1,350 yen) comes with two patties. Which one would you try first? The open cafe Kiki & Lala Cafe is located on the seventh floor of Shibuya Parco Part 1. If you can’t decide, I recommend going with the “Honey Milk Chai Tea” that has both Kiki & Lala on it. There are five Kiki & Lala Cafe limited coasters to collect. The polite and friendly staff will ease your spirits. A long line outside the cafe on a weekday. First Generation Hello Kitty from the &OpenCurlyQuote;70s on Itazura Bank Savings Box! On display from June 9 at Tokyo Toy Show! Get Your Paws on a Hello Kitty Cell Phone - on Sale May 26! The company behind the Internet of Things project, Ola, has teamed up with Sanrio to create a range of exciting new licensed products! The first one to be released is Hello Kitty FIGURINE KT-0, a.k.a. the Hello Kitty Cell Phone! Despite her incredible status and starpower, Sanrio’s Hello Kitty (Kitty) is a Showa-born character that is well known for her generosity in accepting a wide range of jobs. In her second collaboration project with Glico, Kitty finds herself with pretty stars in her eyes, just like other popular characters in Showa girls’ manga. From cosmetics brand AC by AngelColor comes compact face powders themed after seven Sanrio characters called “AC Wonder Collect Face Powder” (1,500 yen plus tax). Love Live! Part 1 Collaboration! Good Smile x Animate Cafe Opens!